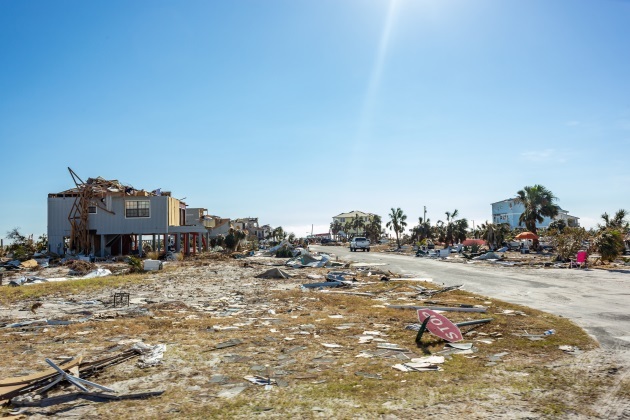 The town of Mexico Beach, Florida, was almost completely destroyed by Hurricane Michael. In the weeks since Hurricanes Florence and Michael swept through the Florida Panhandle, Georgia, the Carolinas, and elsewhere, communities have started to assess damages and plan large-scale recovery efforts. This is difficult since both hurricanes have caused record levels of damage. The most recent Hurricane Michael death toll is at 45 people, while Florence caused 53 deaths. Overall damage reports are now available. Hurricane Michael caused $158 million in damaged crops, and the timber industry has endured $1.3 billion in damages. In didn’t help matters that Hurricane Florence had already done a significant amount of damage, which was only exacerbated by Michael afterwards. In North Carolina alone, an overall estimate of $12.7 billion is the current estimate. This is just to give you an idea of the financial impact for communities in the hurricane zones. On the ground, these early financial estimates may increase as assessment capabilities improve. The Florida Panhandle began its arduous recovery efforts — which proves to be an uphill battle, to say the least. After people began to fix power lines and cell towers, clear roads, clean up yards, and prepare schools for reopening, some areas received more rain, which caused setbacks. Power and cellphone service has returned to some areas, while other areas are still waiting for lights to go back on. Now that normalcy is returning, officials are beginning to wrangle over practices and procedures used in the aftermath of the massive hurricanes. Mexico Beach, Florida is a small coastal community that was all but wiped out. We now see evidence of disagreements about how to proceed. Does the city allow remaining residents to live there while cleanup is occurring? Debates about how to proceed with recovery are also occurring at nearby Tyndall Air Force Base, where 35 percent of the base’s infrastructure was damaged. Vice President Mike Pence visited the base Oct. 25, announcing the intention to rebuild. The Florida Defense Support Task Force toured the base last Friday, and announced that since it was such an important part of Homeland Security and national defense, the goal is to get it running again as soon as possible. The ability to eat, sleep, and attain fuel is now available on the base, which helps the overall recovery effort. Not everyone agrees with this approach to rebuilding Tyndall AFB, though. While the base provides “$2.5 billion in the local economy and 20,000 jobs in…surrounding Bay County,” some wonder whether the estimated $2.5 billion in costs are worth the effort. But given the base’s proximity to the Gulf Test Range, which provides “high altitude supersonic air combat training” some officials speak of returning the infamous F-22 Raptors to the Panhandle skies as soon as possible. Politicians are presently debating various positions on the matter. While officials disagree about recovery plans, it's always a good sign when students are able to return to school. Schools provide vital community resources for students and their families as people scramble to return to work, make homes livable, and help general cleanup efforts. In Bay County’s Panama City, public schools are preparing to reopen on Nov. 12, and some charters and privates will open sooner. In the meantime, there is plenty of damage and plenty of preparations. In fact, some students will be attending different campuses because there’s too much damage and campuses won’t be ready in time. Another startling development in Bay County is the housing crisis. The local paper reports that the Panama City Housing Authority has condemned 450 apartments and will be unable to honor hundreds of Section 8 affordable housing vouchers. The housing authority is issuing evacuation orders to people who have nowhere to go. School reopening will help ease some simple burdens, such as meals, addressing food scarcity issues a bit. But transportation to and from school and housing for students when they are out of class are the kinds of wraparound services required to help communities fully recover. Local hospitals are only able to provide certain healthcare services, while records that support continuity of care are destroyed or permanently lost and people are suffering without adequate medical attention. As the holidays approach and government funding combines with charitable donations and nonprofit efforts, there’s hope that the great Southern states hit by such massive financial and infrastructure losses will begin to feel reprieve.